Your vacation time is a coveted treasure. Make sure to get the most out of it by staying at this magnificent lodge! All the comforts of home and so much more are available to you in this cozy rental. A full kitchen, private bedrooms, and a gorgeous interior with enchanting decor and hard wood floors make this vacation getaway hard to beat! Take a breather out in the private, screened-in porch with a freshly brewed cup of coffee, or take a relaxing bath in the huge jetted tub! When the competitive spirit strikes, challenge your family and friends to a video game competition: there is a Nintendo Wii for your use in this lodge. After the victor is crowned, take in the sights of the wilderness around you. 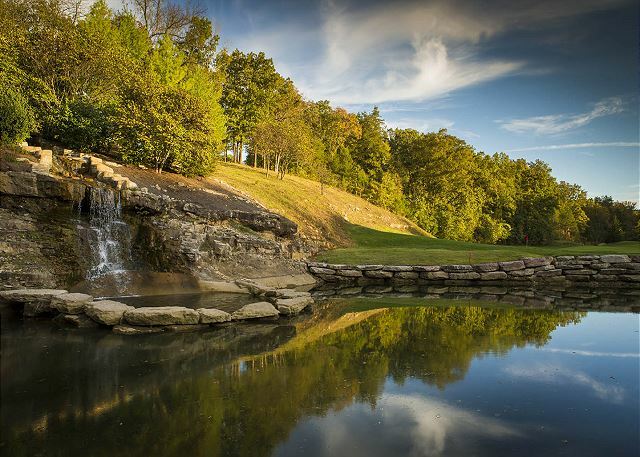 Located in Stonebridge Resort, you're surrounded by the magnificent Ozarks. Take a short drive to Table Rock Lake and make a splash or simply work on your tan by the water. Visit Silver Dollar City and have a great time riding the roller coasters or learning a little more about the way things were done in the past. There are so many ways to spend a day in Branson, so get ready to have a ball! Great family rental near Silver Dollar City. Quite, clean and has all basic needs. Thank you for the wonderful review, Tanya. We are so glad to know that you enjoyed your stay! Don't forget about us on your next Branson vacation! Will stay again! Was everything we they said it was. Loved it! We can't wait to have you stay with us again! It's great to hear that we were able to provide everything you needed, Linda! My wife and I had an incredible time during our stay in the cabin. The cabin was clean and all appliances were clean and operational. As our first anniversary, we wanted to just get away from everyone and everything. This cabin provided just that! It was a wonderful experience. The cabin was clean and attractive. We were able to use the internet and view satellite TV shows. We were very comfortable and enjoyed the stay. This property was very clean! It is pet friendly which is a must for our family! The check-in information was detailed and very helpful. We had a wonderful stay! Everything was as expected. Clean, quite place. Absolutely Perfect! It was tucked away in the perfect place, not hard to get to, close enough to the pool and fishing pond as well as the play area for our 10 month old. We all LOVED it. Gran, Pappi, Nan, Mom, Dad, and Baby! Easy drive to Hwy 76 through Branson and to Table Rock Lake! PERFECT VACATION!!!! Only a few suggestions. Better bed pillows, rope lights outside on the front stairs and remove the tree close to the driveway. On the surface the house looked clean, but as I looked closer, the pots and pans were not. The surrounding area is not ideal for long distance runners: all the roads were too steep to jog on. Moreover the track at the lake starts on one side and end on the other side. You will not be able to jog around it unless you hop across a bed of creek and walk on loose gravel. The pool is too small for the number of people that were using it. We just couldn’t get in because it was too crowded. If you would like to sit around read a book, watch TV, or play games at the kitchen table, then this house would be a good getaway. Thank you for the review. We encourage all of our guests to call as soon as possible for any housekeeping issues so we may correct the problem. There are 2 pools on property but it was a very busy weekend. Please give us a call on your next trip to Branson so we can find a more suitable property with flat ground. Patricia P. from Overland, Mo. The cabin was very nice and clean. There was a wasp nest by the screened in porch but I called management and they took care of it right away. The only thing I would recommend that we had a problem with was there are no hooks to hang your wet bath towels on in the one bathroom which was a problem because 3 of us were using said bathroom. We had taken our 16 yr old dog who has trouble walking and the area around the cabin is very rocky and hilly (no grass around it) so it was very hard to take him out to do his business. This has nothing to do with the cabin but just wanted to let pet owners know in case they have an old pup. Didn't use the resort amenities except for the pool(which you have to drive to) because we were unaware you have to have proper tennis attire to use the tennis courts. 5 of us stayed here and we really enjoyed the cabin and it's location. Very close to the Branson strip. We would definitely rent from Sunset Nightly Rentals again. Location good and house clean and accomodating. Perfect for our needs. Happy we could bring our family pets. House A/C took extra time to cool down but by day two it was fine. There is a wasp issue on side of house by screened porch at corner of gutter and one family member stung (wasps were very aggressive). My wife and enjoyed every minute of our stay and so did our little dog. Felt great to get outta town for awhile. We had a wonderful time staying at your beautiful cabin. It was comfortable, and quite lovely. The screened in porch was a favorite. A very nice place to stay! Clean, well maintained, lots of room for our two couples and pets. Loved the large jetted tub and big bathroom. Steps were not too difficult to manage. Back porch with outside access was perfect for taking out pets. Beautiful location! It was a little confusing on finding the correct entrance into the property the first time but after that it was easy. The property was well maintained and beautiful. The cabin was incredibly clean and welcoming. We spent most of our time outside on the deck. For the most part, it was very private and peaceful until we heard a loud noise and realized a passenger train goes right behind us. We enjoyed our stay and are already looking forward to coming back. Good morning, Aubrie! We're glad that you had a pleasant stay at Dragan's Den. The train does run in that vicinity, but for the most part it's at the same time in the afternoon. We hope it didn't bother you too much! We can't wait to see you again, and don't forget to mention that you're returning guests for a special discount. We arrived on Thursday afternoon and immediately smelled something rotten in the house. After investigating we found the source. The cleaning person had placed the wet mop in the mop bucket and put it in a closet in a bedroom. Once we moved it to the porch the smell went away. Later in the day we decided to turn on the fireplace because it was quite chilly in the cabin. The smell of gas was overwhelming so we were forced to turn it off as well as the valve in the wall. The refrigerator was leaking water onto our food. It was quite frustrating the first two days we were there. Once more settled it got better until the storm and flooding. Our car got hit with hail and sustained some damage. Not anyones fault. During the few dryish times we were able to go outside to walk the dogs and take in the scenery which was nice. On the 3rd day I got bit by a spider in the house and frankly I didn't sleep well the rest of the time. The dogs had a very good time but they were pretty bored since there wasn't much we could do given the weather. Hello, Steven. We apologize for these issues you experienced, and I will take them to my supervisor to make sure they are addressed! I hope you're feeling better from the bite, and I am glad to hear that you still had some good times on your vacation. We had such a wonderful stay at Stonebridge. The cabin, Dragon's Den was nice. Very clean. Very quiet and unrushed. Everyone in Branson was pleasant and helpful. Our 4 yr. Old grandson lived the jacuzzi tub. Thanks for such a nice affordable time away. Hi, Joseph. Thanks for the feedback! We're really glad to hear you enjoyed your stay with us. Branson is filled with such nice people, isn't it? We hope to hear from you again, and don't forget to mention your stay with us to receive a returning guest discount! Thank you so much for your feedback! We're really happy to see you enjoyed your time at Dragan's Den. We hope to hear from you again for any future vacation needs! If you do choose to stay with us again, just be sure to mention your previous stay for a repeat guest discount! We're so glad to hear you enjoyed yourself! We hope to hear from you again in the future of any of your Branson vacation needs. We have stayed at a Sunset property 5 times and we have never been disappointed. They always have pet friendly rentals available and they address any problems quickly. Our cabin was very clean and met all of our needs. We would definitely book a cabin again with Sunset. If you are considering a trip to the Branson area, please check out Top of the Rock. It is beautiful. We loved the cabin and it was gorgeous all around. Very relaxing and quiet. We had a great time in this lovely and cozy cabin. Will definitely come back! Dragan's Den fit our family of 4 need's perfectly for our time in Branson. The beautiful accommodations and well-designed floor plan gave us all the space we needed. The 2 bathrooms, both with whirlpool tubs was an extra bonus that we ALL loved - there were many times when both whirlpool tubs were in use at the same time! If we return to Branson in the future, we would certainly plan on staying at Dragan's Den again. A perfect vacation rental for four. Lovely home feel. We had a hard time finding the unit. If we had known the location we would have chosen a unit closer to the exit of the property. The only things I felt could be improved on were the bedroom pillows were very flat and I would have expected a better brand of toilet paper. Just a little thing but something I would have appreciated. However, we would definitely stay there again. We also loved the restaurant at the club house. Very good food and very reasonably priced. Also the lady who helped us was very accommodating and friendly. Dragan's Den was the perfect spot for our first adventure to Branson. It was clean, spacious, and tucked away in beautiful surroundings and trees.We loved the screened in porch for breakfast in the morning, and the decor and layout of Dragon's Den, also. We look forward to a return trip, hopefully in the not too distant future. We had a wonderful stay at the Dragan's Den. The property was very clean and everything we hoped it would be. We would gladly stay there again. THIS WAS THE THIRD STAY WITH YOU. I LOVE THE PLACE AND WILL STAY AGAIN SOON THE PEACEFULNESS AND THE SURROUNDING WAS GREAT. EVERYTHING YOU NEED IS IN THE LODGE. THANKS AGAIN FOR A GREAT TIME. Great to see you back, Jean! We're always happy to have our repeat guests return year after year. Dragons Den is our favorite cabin to stay in when we come to Branson! Thank you, Paula. We're glad that you enjoyed your stay and hope to see you back soon! The cabins were great, nice view, quiet neighborhood, plenty of space, great kitchen with accessories, didn't have to eat out once. Thank you for your review, Carl. We are glad the cabin had everything you needed to enjoy your stay. Let us know when you are planning a trip back to the Ozarks for your Repeat Guest discount! It was a very beautiful cabin and away from traffic and noise. Very peaceful. Loved the screen in porch and large sizes of the bedrooms and bathrooms. Will definitely come back to this location again. Great view, very clean, and was in a great location. The Cabin was amazing. We had 2 adults and 3 children in this 2 bedroom cabin, and there was more than enough room. We cooked all of our meals in the kitchen. We are already planning our next stay in these cabins. Best spot in Branson.